Welcome to the online platform "IHO List Of Disinfectants". This is a list of effective disinfectants for professional applications in healthcare, food production and animal husbandry. This list has been published by the Industrieverband Hygiene und Oberflächenschutz (IHO) since 2008 and is available free of charge for use by users. The platform is intended to help them to evaluate the properties of corresponding products simply and transparently. The focus of the preparations is, according to the specific requirements in each case, in the areas of health care, food hygiene, animal husbandry and general hygiene. The statements regarding efficacy are based on tests in accordance with nationally and internationally accepted standards and guidelines. The main focus here is on evidence of efficacyin relation to adopted European standards. It is important that effective disinfection is always carried out according to the latest scientific and technical findings. It has been shown in the past that historically based, national test methods can no longer fully guarantee this. Please note that the entries in the list are the sole responsibility of the respective companies. If you have any questions about the products, please contact the manufacturer/distributor directly. You will find more details in the preamble. The listing companies are convinced that this list is a valuable contribution to the reasonable use of disinfectants in accordance with indications. 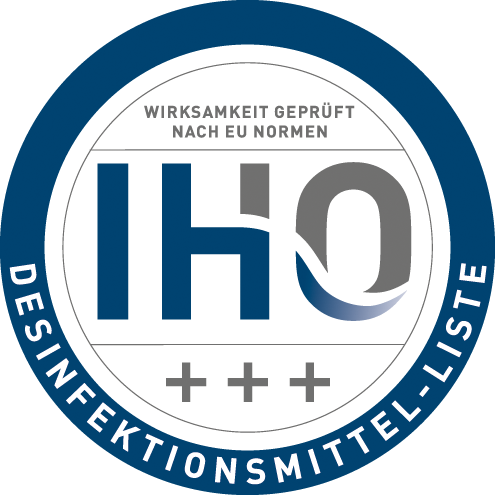 The copyright to the IHO List Of Disinfectants lies exclusively with Chemie Wirtschaftsförderungs-GmbH (CWFG) and Industrieverband Hygiene und Oberflächenschutz (IHO). When duplicating or distributing the list or transferring content to external websites, the corresponding data may not be changed, falsified or otherwise manipulated. It is always necessary to link to the IHO List Of Disinfectants list as the source of the information. Since 1 February 2019, the Industrieverband Hygiene und Oberflächenschutz (IHO) has published the most comprehensive overview of effective disinfectants in Europe free of charge. The IHO disinfectant list (www.desinfektionsmittelliste.de) offers professionals in the professional cleaning and hygiene field a quick overview of disinfectants and their effectiveness for the application areas health care, food industry and animal husbandry thanks to its user-friendly sorting function. Information on virus-active products in the area of health care has so far been kept on a separate list. As of February 2019, the IHO disinfectant list will serve as a central platform and first point of contact for online product research. It supports specialists in evaluating the properties of relevant products simply and transparently. Hygiene experts from the field will find all relevant information on the efficacy of over 1,100 disinfectants. Every year, tens of thousands of users access the constantly growing product overview. In the current three fields of application, there is no comparable list that provides interested users with information on active substances, concentration, duration of use or efficacy of so many products and manufacturers. No account is required to use the freely accessible online platform, which is also available in English. The effectiveness of the products has been confirmed by accredited testing laboratories. The disinfection products in the IHO disinfectant list are listed according to their effectiveness according to current European standards. The IHO is the sole copyright holder of this list of disinfectants. Duplication of this list and dissemination of this list are not allowed without the express consent of the copyright holder. The incorporation of data from this list into other websites is not permitted, either. Linking from other websites outside the IHO is welcomed but requires the written consent of the IHO. In 1998 the European legislator adopted the Biocidal Products Directive (since September 2013: Biodical Products Regulation (EU) No 528/2012). This piece of legislation prescribes the Europe-wide registration and authorization of disinfectants. In the future, the efficacy of biocidal products will have to be assessed by the competent authorities within the authorization procedure – and exclusively European standards (harmonized test methods) can be applied for the proof of efficacy, unless no such standards are available to furnish the proof of efficacy as required. For historical reasons, the various Member States had (and still have) national tests based on different methods for determining the efficacy of disinfectants. The test guidelines in Germany are issued by human and veterinary medical societies while there are entirely different test standards, for example, in France or the Netherlands. In order to harmonize the standards and requirements for the efficacy of disinfectants in Europe, the European Committee for Standardization (CEN) has been developing since 1988 harmonized test methods (standards) in the fields of foodstuffs, animal keeping and medicines. 33 countries are participating in the CEN; Germany is represented by the Deutsches Institut für Normung (DIN). Against this backdrop, the IHO member companies decided at an early stage to have their disinfectants tested according to European standards, with a view to making their efficacy data more transparent for users. This list of disinfectants constitutes an overview of the efficacies of chemical disinfectants for use in all areas of animal keeping, food production and processing, food preparation and other institutional sectors. Testing of phase 1 consists of quantitative suspension tests, in order to confirm that active substances or products undergoing development have a bactericidal, fungicidal or sporicidal effect, without specifying any field of application. Tests of phase 1 cannot be resorted to for use recommendations. (1) Phase 2, stage 1 (2/1) consists of quantitative suspension tests, in order to confirm that a product has a bactericidal, fungicidal, levurocidal, mycobactericidal, tuberculocidal, sporicidal or virucidal effect – under simulated practical conditions that are suitable for the intended use of the product. This testing proves the irreversible inactivation of non-dried microorganisms by the tested product solution. (2) Phase 2, stage 2 (2/2) consists of quantitative laboratory tests, in order to confirm that a product has a bactericidal, fungicidal, levurocidal, mycobactericidal, tuberculocidal, sporicidal or virucidal effect when the product is applied onto a surface or the skin under simulated practical conditions (e.g. surface and hand disinfection tests; so-called “germ carrier tests”). This testing provides information on the effect against dried microorganisms on surfaces. Tests of phase 3 are field tests under practical conditions. At present, modes of procedure are not available as yet for this type of testing. All tests need to be carried out according to the minimum requirements set out in the standards (mandatory conditions). Depending on the claim for a given product, tests have to be performed under additional conditions (test organisms, temperatures, application times and interfering substances), according to the requirements of the standard (additional conditions). Testing of phases 2/1 and 2/2 are generally necessary in combination, in order to substantiate the efficacy claims for disinfectants. Deviations from this principle are possible only in exceptional cases (e.g. CIP application). Both test results need to be taken into account when deciding on the product claim (also see points 4.4 and 4.5 of prEN 14885:2014). An overview of the standards available for the various fields of application and their uses is included in EN 14885 (prEN 14885:2014). The efficacy data compiled in the IHO List of Disinfectants are based on the requirements of prEN 14885 (under current terms and conditions). These data serve as a basis for manufacturers who wish to issue concrete use recommendations for their products, depending on the field of application under practical conditions. These particulars should be taken from the relevant information provided by the manufacturers. This list comprises exclusively disinfectants tested according to DIN EN standard for use in veterinary hygiene, food production and processing, food preparation and other institutional sectors. The list is also accessible to disinfectant manufacturers and distributors who are not IHO members. The rights and obligations regarding this listing are laid down in a contract between the manufacturer/distributor and the IHO. The information provided is based on testing according to existing European standards; the individual companies provide such information exclusively at their own responsibility. Proof of efficacy can be furnished by both independent and in-house test facilities on condition that these have implemented obligatory and audited quality systems. As operator of this listing, the IHO runs a quality assurance programme for the data in the IHO List of disinfectants. Within a working group specifically set up for this purpose, experts from IHO member companies examine the entries in the list. They check the compliance of the entries with the legal framework conditions and with the conditions for authorization. Furthermore, the entered data are checked at least with regard to their plausibility. Should questions or unclear points arise, the manufacturing companies are contacted and asked for clarification. If no clarification can be achieved in this way, the IHO is entitled to request submission of the original expert opinions and to check the entries in that manner. In cases of infringement of the contractual obligations, the IHO reserves the right to delete the entry for the product at issue or, where this is justified, all entries of the concerned manufacturer/distributor from the list. At their own responsibility the manufacturers/distributors ensure that the existing proof of efficacy applies to currently marketed formulations across their entire shelf-life, and they update the entries in the IHO List reflecting the state of the art. Only those products are included in the list which have been registered with the German registration authority (Federal Institute for Occupational Safety and Health/BAuA) according to the German Ordinance on Notification of Biocidal Products (Biozidmelde-Verordnung) and are thus eligible for placing on the market. Manufacturers/distributors accept their contractual obligation to be always in a position to substantiate their entries. The IHO member companies are firmly convinced that this list makes a valuable contribution to using disinfectants in a manner which is both reasonable and adequate for the given indications.